I have this "thing" against slow cooker meals that have outside steps added to them. In my mind, if I'm making something in a slow cooker, I don't want to have to dirty any other pots and pans; I want the meal and the mess contained. Have I stated this before? I'm getting a little feeling of déjà vu here. Well, if I have, it bears repeating. This probably limits my scope in the grand scheme, since I don't have a slow cooker with a browning feature built in. But it's on my short-list, for sure. That said, I've been able to adapt most recipes to fit my "slow cooker ideal". 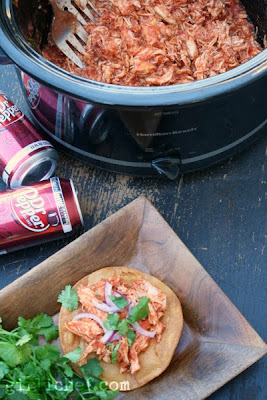 Take for instance a recipe for Dr. Pepper Chicken Tostadas that beckoned me from the pages of Scarletta Bakes. It was one of those times when the instant I saw it, I knew I'd be making it soon. But Meagan divides hers into two steps: cooking the chicken in the slow cooker and saucing it up on the stove top. Wasn't gonna happen. Though I stuck to her ingredients and basic formula, I worked it out so that the only dish I had to dirty, was the crock of my slow cooker. Oh yeah. 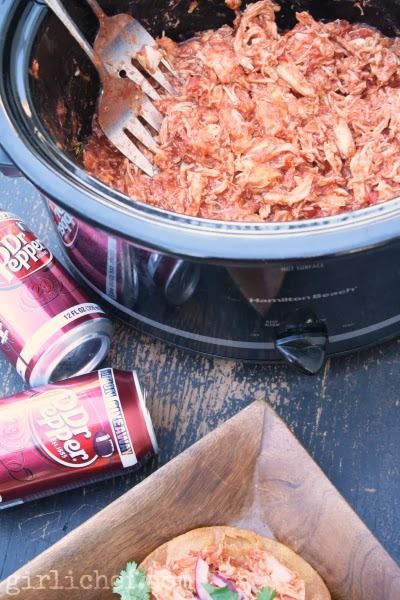 This shredded chicken is pretty habit forming. The Dr. Pepper flavor isn't pronounced, but it adds this underlying layer of flavor that, if you didn't know it was Dr. Pepper, you'd probably be trying to "put your finger on" what exactly it was you were tasting, the whole time you were eating. 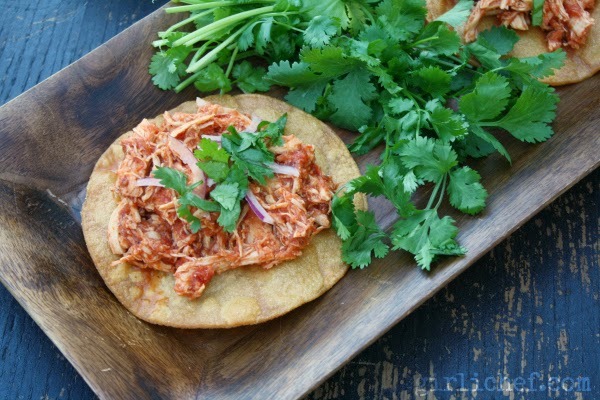 I did pile it high on tostada shells, but I also used it as a taco filling. I bet it would be equally as good stuffed inside of a burrito or a chimichanga. ...please excuse my liberal use of "air quotes" today. Make this tender, sweet and spicy shredded chicken in the slow cooker for a quick anytime meal that will satisfy the whole family. Place the chicken breasts into the crock of a slow cooker. Whisk together the Dr. Pepper, vinegar, and tomato paste; pour the liquid over the chicken. Put on the lid and cook for 3-4 hours on low or 2-3 hours on high. Carefully drain (and discard) the liquid from the croc. Add the chicken breasts back to the crock of the slow cooker. Add crushed tomatoes, garlic, and chipotles with adobo sauce to the pot. Use two fork to pull and shred the chicken breast, and stir everything together. Cover and cook for another 1-2 hours on low. Season to taste with salt and pepper. 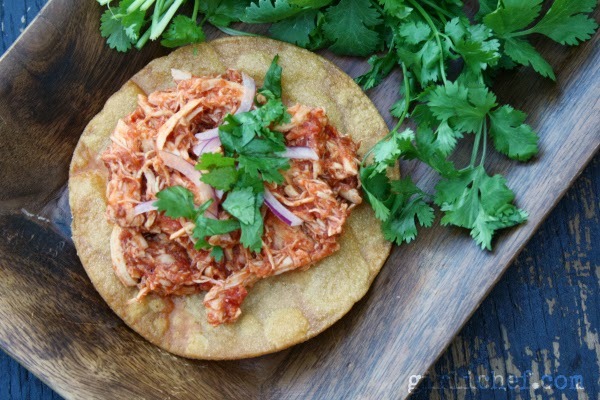 Serve the shredded chicken on tostada shells, or in warmed corn tortillas with your choice of toppings.